The object storage systems used by cloud storage providers (CSPs) are designed to bring scalability, reliability, and near zero management to their data centers while significantly reducing storage acquisition costs through the use of commodity drives. These attributes are in high demand for any data center but they are especially attractive for Tier 2 data centers. Unfortunately, object storage often requires customized application API access—limiting its use in Tier 2 data centers. Can object storage address these accessibility issues and fulfill its promise of reliable, scalable, economical storage for all types of data centers? 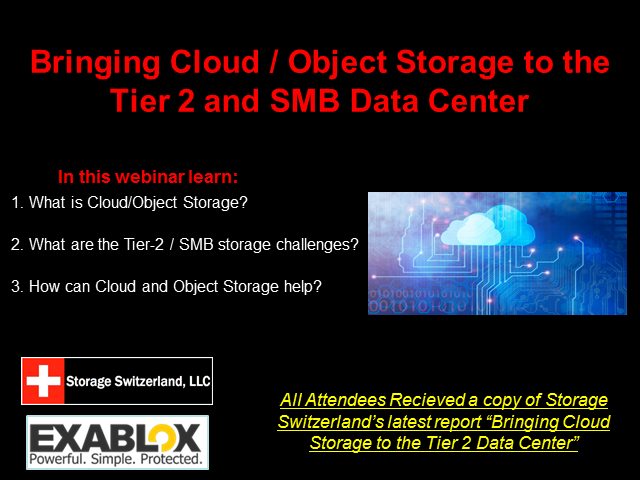 In this webinar George Crump, Lead Analyst with Storage Switzerland and Sean Derrington, Senior Director of Products for Exablox will discuss the benefits of Object Storage and how it can be designed to meet the realities of the Tier-2 / SMB Data Center.